Automobile collision repair isn't just about body work. That accident just turned your whole world upside down. So, in addition to fixing your car like new, we help you get your life back on the road with personalized services. You forget the hassle and inconvenience. You've already endured enough interruptions to your day. So, let us pick up your car for you. If it can't be driven, we can handle it. Just give us a call, and we'll arrange for reputable, skilled towing specialists to bring your vehicle safely to our shop. Our close relationships with top car rental agencies make sure you get temporary transportation right away - and in the kind of car that you want. Just because your car is out of commission, doesn't mean you shouldn't be driving in comfort. We perform most mechanical repairs related to collision damage in our shop and work with major dealerships and certified technicians so your car runs as well when you get it back as it did before it was damaged. 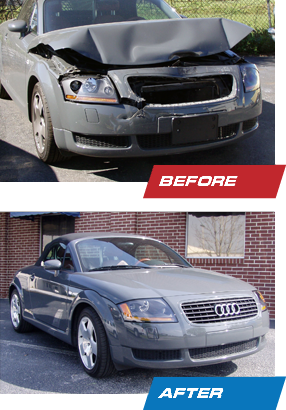 Auto body repair is a dirty business.Our detailing specialists make sure that when your car is returned to you, it will be cleaned thoroughly inside and out - just the way you like it. While your car is in our care, it's protected by 24-hour Sonitrol video surveillance. When your car is ready to come home, we offer an optional delivery service for your convenience. Are you from out of town? We can arrange professional, enclosed truck transportation to anywhere in the country.